NeverSeconds: From Barcelona in secret. Those meals look really appealing, I have never had striped catfish. Do you have options or would these dishes be the only choice available. Great post and thank you for sharing, hope to see some more! Love the stainless steel trays. Much more appetizing than the cardboard boxes pictured recently. Thanks! 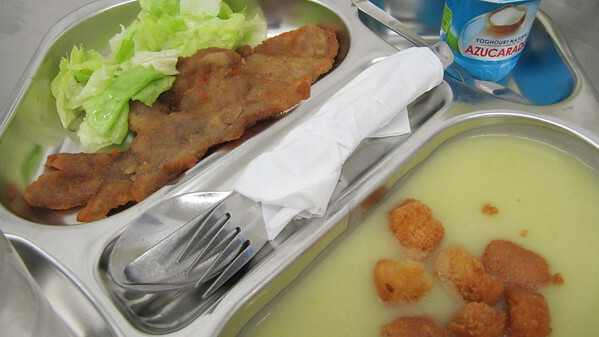 Those meals look very appetising and substantial. What age are the children - primary or secondary? We had a holiday near Palafrugell (north of Barcelona) a few years ago, and the tap water cannot be used for any kind of consumption (including teeth cleaning unless just for a few days) so bottled water has to be used in kettles and in all cooking. I think it is because the tap water comes the Pyrrenees and has a high mineral content, and potentially toxic. Luckily 5L containers were just a few Cents. If only you would tell us where you are - then we could all come and eat your food. It looks fantastic! 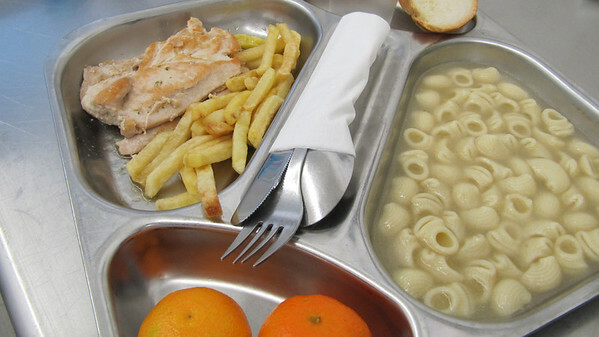 These look like some of the best school meals so far. You should be proud and tell people at your work so they can see. Using stainless steel plates too. How much better to eat from them compared to Styrofoam or cardboard. And they'll last forever almost! Great post very interesting - Thanks!! It's nice to finally see some good quality nutritionally balanced meals on here. 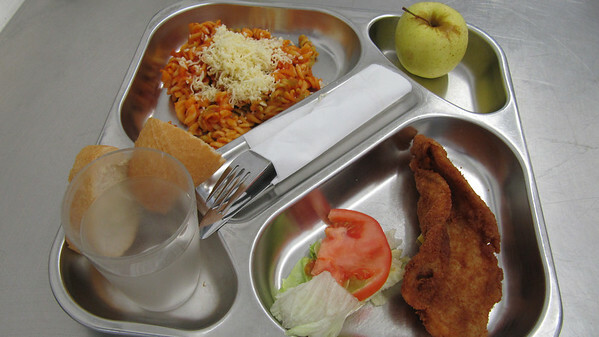 What age range are these meals for? Mediterranean cooking at its best for a canteen setting. Well done to the cooks! 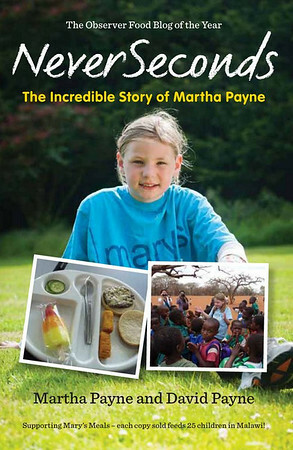 My question is :surely the price of these meals are more than £2 (equivalent)? And now the political question : can someone explain to me why in the UK we deeme that £2-3 is what needs to be spent on a meal? Where is this figure coming from? 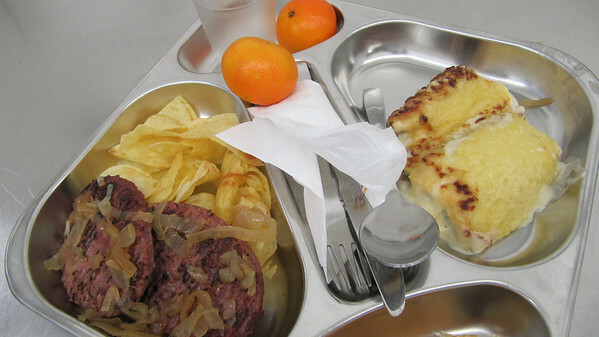 It's good to see a Barcelona school on this blog as the food for children is generally good here. 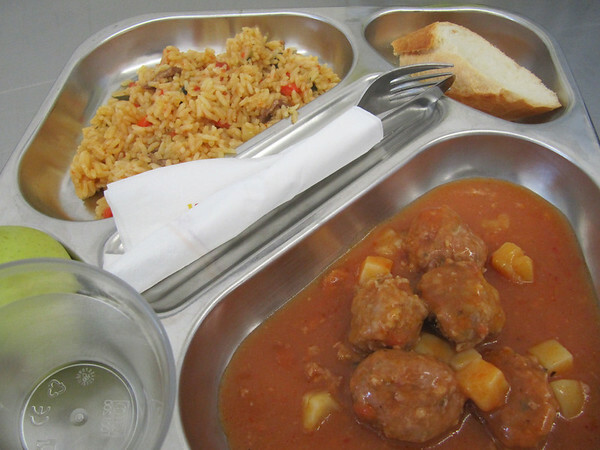 However, 6 euros a day is a lot of money and getting a grant for school meals is more and more difficult these days. The tap water isn't so bad in Barcelona, it just doesn't taste very nice, I heard the water board saying that if you leave it to stand for a while it loses that chlorine taste. A filter would be cheaper than bottled water as so much plastic is generated. I wonder if this is a private or public school. Congratulations on your English from an English teacher at the UAB.. I love seeing a school cook being proud of the food she/he makes. I wish they all could be proud of it.